1 Pen, pencil, or piece of chalk. Fabric Glue or a sewing machine. Measure from base of your neck to the floor (either with a measuing tape or by marking a piece of string and measuring the string with a ruler). If you measured over 65 inches, this pattern will be a bit short for you. You will need 1 Cape, 1 Capelet, and 2 Head panels. Put the fabric flat, unfolded on the floor. Tie a piece of string to some chalk, make the string 60". (You could also use pencil/pen). Put the chalk at the top left corner and the string along the top. Mark the point the string ends. Have someone hold down the end of the string on this point. Move the chalk in an half-circle to draw the cape. Cut the string to 30". Find the point at the center of the capelet (30" down and 30" right from the top right) and mark it. Place the end of the string on this point and have someone hold it there. Move the chalk in a circle to draw the capelet. Draw a line from the middle point to the edge. Cut the string down to 6". 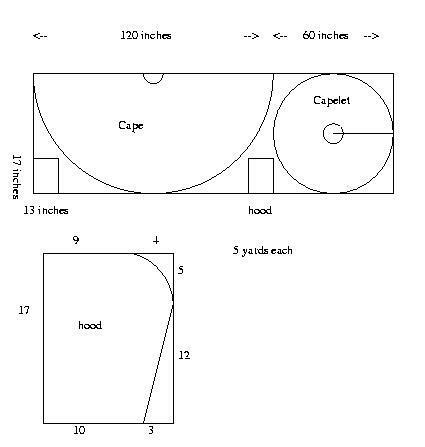 Place the end on the point you made for the cape and draw a half-circle. Cut the string down to 3". Place the end on the point you made for the capelet and draw a full-circle. Draw 2 hood sections. You'll need the ruler for this part. Cut along the lines you drew. Place the 2 hood panels together with right sides in. Attach along the top and back edges. Not the front (face hole) or bottom (neck hole). Place the cape flat on the floor, outside up. Place the capelet flat on top of it, outside up so that the edges of the neck overlaps that of the cape. Attach them. Place the cape/capelet flat on the floor, outside/capelet up. Place the hood on top of that, inside up, so that the edges of the neck overlap. Attach them. Hem the edges of the cape and capelet. Cut strips of fabric to use as ties. Make sure they don't stretch to be longer if pulled on (only a problem with strechy fabrics). Attach the strips at the edges of the neckline.